The world’s number one heavy equipment manufacturer has been hit hard by the decline in mining and construction – sales are down more than $20 billion from its 2012 peak. On Friday the Peoria, Illinois-based giant had to cut 2016 revenues forecasts again and now sees sales $2 billion lower at between $40 billion to $42 billion. The mining industry make up 19% of CAT’s total sales (quarrying and aggregates account for another 10%) and worldwide sales to the sector dropped 25% in March on a rolling 3-month average basis compared to last year. 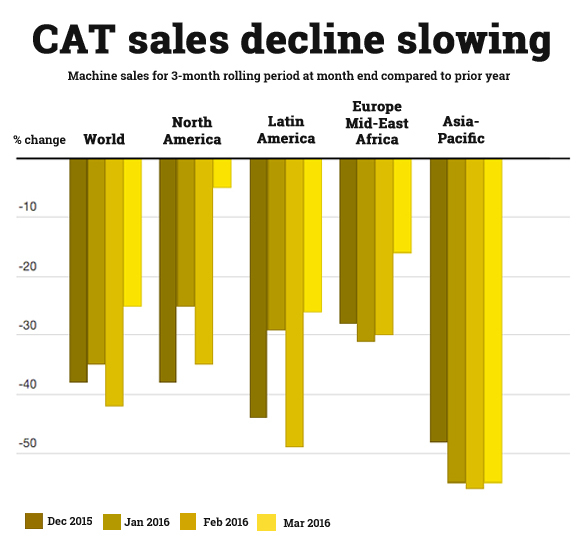 March was the 40th month in a row there were fewer buyers of the company’s machines (although the rates of decline are slowing). With the release of its full year earning in January Chairman and CEO Doug Oberhelman said the company hasn’t seen any signs of improvement and was reluctant to predict a bottom for the industry. “Commodity prices improved from their recent lows, but excess supply remains. It is not clear at this time that the current prices are either sustainable or sufficient to drive increased demand for equipment.